There are a few reasons a good Christmas punch makes the perfect holiday party beverage: It looks and tastes festive. It will serve lots of people. The same recipe can work for adults and kids if you put the liquor on the side and let people spike their own drinks. And is easy to keep refilled—which means you can focus on your guests, not the bar. Set out your crystal punch bowl, decorative pitcher, trendy drink dispenser, or slow cooker (for hot beverages) when you decorate. You can keep batches of pre-made punch in the fridge to put out at party time. Doubling or tripling the recipe means you can provide quick refills as the night goes on. To keep ice your drinks without watering them down, make your punch the day before and freeze some in ice cube trays or a Bundt pan. Serve liquor on the side and let guests add their own. Every guest will feel special when you serve them a steaming mug of delicious Rum-pum-pum Hot Rum Punch topped with a grilled pineapple ring. 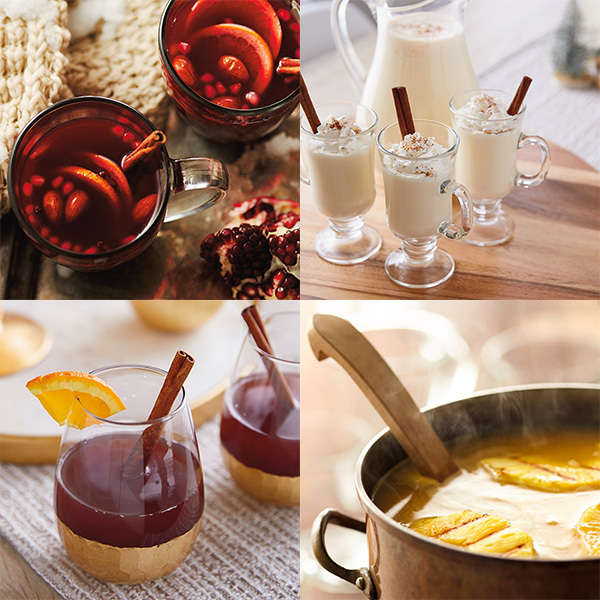 In this Hot Rum Punch recipe, we used Myer's dark rum, R.W. Knudsen pineapple coconut juice, pineapple juice, pumpkin puree, fresh lemon juice and spices to create a sweet, tangy and toasty hot rum drink. Pomegranate seeds add a holly-berry touch to this mulled wine and citrus punch. Any spicy red wine can serve as the foundation for the festive drink. Pomegranate, pineapple and orange juice turn up the fruity flavor, and the cinnamon sticks and cloves add the right amount of spice. This holiday punch recipe makes enough to serve—and delight—several lucky revelers.